Ancient Romans once fled to the Venetian Lagoon to escape Attila the Hun. These days, discerning travelers are going there to get away from the marauding hordes in Venice's commercial center, which hides behind a carnival mask of mass tourism. With sighs of relief, they find sanctuary at places like Venissa, tel: (39-041) 527 2281, a world-class restaurant with six stylishly spare rooms set on an idyllic vineyard estate on Mazzorbo Island, just across a footbridge from the quaint fishing enclave of Burano. Chef Paola Baudel serves up innovative dishes featuring fresh local catch and organic produce from the nascent garden, such as raw monkfish with gelatin minestrone, and sliced octopus atop pea-and-mint cream. Veneto winery Bisol is reviving the vineyard as part of a lagoon-restoration project that began with Isola della Certosa, where it runs a hotel and restaurant, tel: (39-041) 277 8632. Nearby is a design school focusing on traditional boatbuilding and a marina where you can take sailing lessons or rent a vessel. If you go for an evening sail, you might pass a clam digger on the Baccan sandbar. 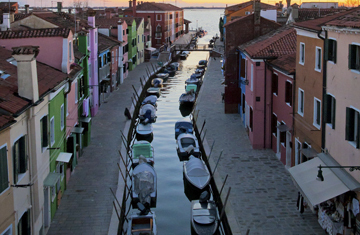 Burano (left) draws plenty of day-trippers, so it pays to arrive in the evening, when the locals emerge from hiding  designer Philippe Starck now owns one of the brightly colored houses  and stay the night on sleepy Mazzorbo. In the morning, visit Burano's fish market and the newly refurbished lace museum, Museo del Merletto, tel: (39-041) 730 034, then jump over to Torcello, a swampy island populated by around 20 souls and once home to Ernest Hemingway. Spiritual sustenance can be found in the medieval mosaics of Santa Maria Assunta, the oldest building in the lagoon, and corporal nourishment at Locanda Cipriani, tel: (39-041) 730 150. It's kin to Hemingway's legendary San Marco haunt, Harry's Bar. Alternatively, hop on a boat to pastoral Sant'Erasmo, the vegetable garden of Venice, where you can buy produce at the Finotello family farm, tel: (39-041) 528 2997. The saline soil makes agriculture a challenge, but it is also why the namesake violet artichoke is so flavorful. "They often try to pass off the Livornese artichokes as ours, but when you taste them, you know better," Carlo Finotello says. Venetians go for weekend picnics, and you can rent bikes near the dock for a whiz through the lush landscape, passing vineyards and canals. A leisurely six-course lunch at the Ca'Vignotto farmhouse is wonderful, tel: (39-041) 244 4000. Afterward, head to the Habsburg Massimiliano tower for a panoramic view, then walk to the Seca del Bacán wildlife reserve and see flocks of migratory wading birds. More than 50 islands dot this saltwater bay, most of them left only with the relics of a rich history and ghosts of the plague that wiped out a third of the population by the 17th century. A bustling trading area when the Venetian Republic stretched from the Alps as far south as Crete, the lagoon began to decline in 1797 under Napoleon, who shut down its monasteries and converted many of the islands into fortified garrisons. Tiny Lazzaretto Nuovo, lying just off Sant'Erasmo, was the place where merchant ships had to pass inspection during the 14th century Black Death. You can visit the storehouse where cargo from far-flung places, mostly Oriental spices and textiles, was fumigated while sailors waited out quarantine. The artifacts they left behind  pipes, coins and pottery  are exhibited in an old gunpowder magazine. Be sure to stay awhile. With the glass industry in decline, a couple of luxury hotels are being constructed in former factories on Murano, and some Burano houses are being converted into holiday rentals. However you do it, the lagoon is a breath of fresh air and a glimpse of Venetian life the way it should be seen  from the water and with the package-holiday crowds a long way off. See pictures of the floods returning to Venice.